Christmas break during her second year of college should have been a happy and relaxing time for Brittany Burns of Brentwood, Tennessee. She was looking forward to a month off with her close-knit family and hometown friends before returning to the University of Tennessee at Chattanooga. The 20-year-old hadn’t felt well for weeks, fighting extreme fatigue and a nagging cough. Between Thanksgiving and Christmas breaks, she visited an urgent care clinic and left with a prescription for cough medicine, but no diagnosis. The cough and fatigue lingered. Shortly before Christmas in 2013, after a battery of doctors’ visits and tests to rule out what was suspected to be cat-scratch disease, a biopsy of her lymph nodes revealed that she had Hodgkin lymphoma, a cancer of the white blood cells called lymphocytes, part of the body’s immune system. A diagnosis of cancer at any age is tragic, but during the adolescent and young adult (AYA) years (ages 15-39), it’s especially complicated, said Scott Borinstein, MD, PhD, associate professor of Pediatrics at Vanderbilt University Medical Center and director of the Adolescent and Young Adult Oncology Program at Monroe Carell Jr. Children’s Hospital at Vanderbilt. Children’s Hospital has providers attuned to the needs of teenagers and young adults who can offer coordinated and comprehensive cancer care, delivered in a nurturing and supportive way for the patients who aren’t children, but in so many ways aren’t adults either. When an AYA cancer patient comes in for treatment, there is first a discussion about whether he or she should be treated by an adult or pediatric oncologist and whether that care should occur at Children’s Hospital or Vanderbilt-Ingram Cancer Center, Borinstein said. The decision comes down to the type of cancer and the location of the expertise. Scott Borinstein, MD, PhD, is passionate about helping teens and young adults battle cancer during what he calls a “vulnerable time.” Photo by Susan Urmy. AYA patients receive their treatment from pediatric specialists at Children’s Hospital if their cancers are of a pediatric type — leukemias, bone and soft tissue cancers — and they are treated by adult oncology physicians if they have a cancer normally found in adults — like breast, cervical and melanoma. Borinstein said the program attracts patients from Tennessee, Kentucky, Alabama and other states. “We have the benefit of being in a medical center with experts in pediatric and adult cancers who have the temperament and passion to take care of this unique population of patients,” said Borinstein, who specializes in sarcomas, highly malignant cancers of the bone and soft tissue, and directs the pediatric sarcoma program at Children’s Hospital. “We try to identify for our teens and young adults the best oncologist, surgeon and radiation oncology team that not only provides the expertise needed to develop and implement the optimal treatment plan, but also will provide and coordinate supportive care services AYA patients need to assist them throughout cancer treatment. We try to merge aspects of adult oncology care with the support and nurturing we give patients in the pediatric world. About 70,000 young people (ages 15-39) are diagnosed with cancer each year in the United States, accounting for about 5 percent of all the nation’s cancer diagnoses. This is about six times the number of cancers diagnosed in children from birth to 14, according to the National Cancer Institute (NCI). Leukemia, lymphoma, testicular cancer and thyroid cancer are the most common cancers among 15- to 24-year-olds. Among 25- to 39-year-olds, breast cancer and melanoma are most common. Cancer is the leading cause of disease-related death in the AYA population — only accidents, suicide and homicide claimed more lives than cancer in 2011, according to the NCI. As part of A Campaign Against Childhood Cancer, donors are helping address AYA cancer patients’ needs. Unfortunately, the treatment outcomes for AYA cancer patients have not improved over the past few decades compared to those for pediatric patients or older patients. The reasons for this “AYA gap” are complicated, Borinstein said, but lack of health insurance or a parent living with them to encourage medical attention often leads to a delay in seeing a doctor. When they finally get to a physician, Borinstein added, the cancers that can affect AYA patients are often rare, not the type of cancers that community oncologists have much experience managing. Coming to a place like Vanderbilt, with experts who treat rare cancers in children, teenagers and young adults, is crucial. It’s also vital that this group receive psychosocial support before, during and after therapy since the incidence of depression and anxiety is very high in this patient population, Borinstein said. “Patients diagnosed with cancer early in college, for example, might have to leave college and move back home with their parents. Instead of being on their own, learning to be independent and autonomous, they become dependent again. The Children’s Hospital team can also help the young adult who might be off his or her parents’ insurance plan find financial support if needed. Brittany, now 25, said that she relied heavily on her faith and her family during her cancer treatment. Two days before Christmas in 2013, she had a port put in for chemotherapy and had a bone marrow biopsy. On New Year’s Eve, she had her first of five rounds of chemotherapy. “I got the kitchen sink — every concoction possible,” she said. The cycle repeated for a year — three days inpatient, home one week, one day outpatient and 21 days to recover, for five rounds of chemotherapy. The cancer responded, but she had many complications, including hospitalizations because of nausea and vomiting, weakness, weight loss and resulting muscle wasting. In addition to the physical complications of chemotherapy, it was also an emotional time for Brittany. She had many friends at UTC and had planned to start nursing school in the fall of 2014. “Everybody says that your college years are the greatest years of your life. School had always been a large priority in my life, and I felt like that time was taken from me, and my social life was taken from me too,” she said. Her bond with her family became stronger, and she met friends she never would have met (without having cancer), but a few of her existing friendships suffered. But she also feels like she gained a new outlook on life. She has been in remission since April 2014. She continues to be monitored periodically at Children’s Hospital and will remain with Vanderbilt-Ingram Cancer Center’s REACH survivor program, a comprehensive clinic for survivors of all ages who have faced any type of cancer. In 2014, Brittany took two classes at Columbia State College. 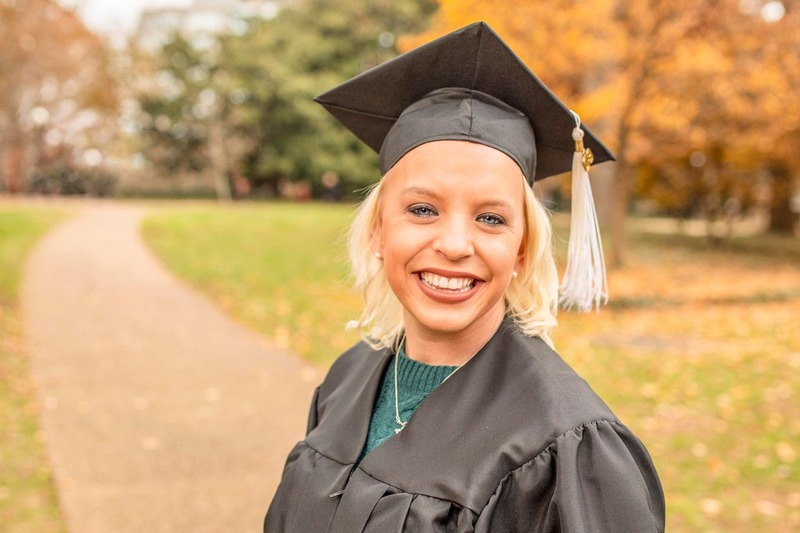 She kept that schedule for two years, then began nursing school at Belmont University where she received her nursing degree in December 2018 — one day short of the day five years prior when she was diagnosed with cancer. She hopes to pursue a career in pediatric oncology. “It’s my passion. There is so much I could do to help patients going through what I went through,” she said, adding that she still keeps in touch with the nurses who helped her during such a difficult time in her life. Dillon Porter, 18, of Russellville, Kentucky, was 14 and a freshman in high school when he learned he had non-Hodgkin lymphoma, another type of white blood cell cancer. Dillon Porter, 18, who was diagnosed with non-Hodgkin lymphoma at age 14, is now a freshman at Brescia University. Photo by John Russell. He played saxophone in the band, was on the varsity soccer team, and was also set to play baseball and swim for his high school swim team. He had to take a year off from high school, but was able to pass his freshman year with the help of a teacher for homebound students. By about three months into his junior year, he finished treatment. “It was pretty rough,” said Dillon, now a freshman at Brescia University in Owensboro, Kentucky. None of the nausea medications helped with the side effects of chemotherapy, so he had to return to the hospital often to get it under control. His hair came out in patches, and he buzzed it, although his doctor at the time suggested that he “do something crazy with it,” like dyeing it a bright color or shaving it into a Mohawk. “Thank goodness my mom didn’t let me do that,” he laughed. Polly Porter, Dillon’s mom, said when Dillon was first diagnosed, he worried that the diagnosis would keep him from being a normal teen. Would he be able to get his driver’s license? Could the family still go on vacation the following summer? But the family soon went into “autopilot mode,” trying to take one day at a time and focusing on the positives: his hair should grow back in time for prom and senior pictures, and he should be able to go off to college at the same time his friends were going. Now in remission, Dillon, a patient of Borinstein’s, returns to Children’s Hospital every six months for careful monitoring. Borinstein said the good news with AYA cancers is that once you reach the five-year mark, it’s unlikely your cancer is going to come back. However, long-term side effects, such as infertility or the development of secondary cancers, are possible. “A lot of the treatments we give can impact their ability to have children. We provide fertility counseling to every AYA cancer patient we treat and discuss fertility preservation resources like sperm banking and egg harvesting before starting therapy,” Borinstein said. Holly Tyler, RN, BSN, has worked with adolescent and young adult cancer patients since completing a nurse residency program in 2005 at Vanderbilt. She worked on the inpatient floor taking care of AYA patients for a decade, and now works with them during their chemotherapy infusions. Dillon Porter is one of her patients. “It’s an honor to be part of their care for as long as they’re seen at Children’s Hospital,” Tyler said. AYA patients are often “mad at the world. But I love helping them deal with that, talking through difficult times,” Tyler said. “I enjoy the awkward conversations. I worry they’re not having them otherwise. They’re going through so many things at this age, and then to throw cancer on top of that. Some kids don’t want to talk to their parents, they might be afraid of losing friends, and I try to help them get those thoughts out,” Tyler said.